as a person speaks to a friend. For those of us today who want to hear God’s voice in the midst of our own chaos, St. Benedict is a perfect patron. How can I take the “good speech” of God into my heart so that, upon entering my bloodstream, so to speak, it extends through my body’s arteries and veins to all extremities and animates my whole being? In other words, how can I hear the Word of God as St. Benedict did, so that, like him, I might be a saint in the midst of our challenging times? First, like all things sacramental, we should know that the substance of the liturgical word — each scriptural sentence and every liturgical syllable — is, chapter and verse, Jesus, the Word. The beginning of St. John’s Gospel captures this truth clearly. Called the Prologue, which means “before the word,” the Evangelist proclaims, “In the beginning was the Word, and the Word was with God, and the Word was God” (John 1:1). When we reflected on the Sign of the Cross, we heard that it was through this Word that the Father and the Spirit created all things: “God said . . .” (see Gen. 1). Proclaiming this same word to the Lord’s Chosen People, the Old Testament prophets sought to redirect the Israelites’ hearts to God. For, as even the Jews understood, by the wise word of the Father, God “appeared on earth” and was “at home with mortals” (Bar. 3:38). To this degree, Jews and Catholics understand how important the “word” is to prayer and liturgy. But all these words of the Old Testament reveal a single word, the first and last word of the New Testament. Thus, to hear and say and pray the Scriptural Word is to hear and say and pray the Eternal Word. The liturgical word is brimming over with the Divine Word — and this truth should prick our heart’s ears. Fifteen hundred years ago, St. Benedict called us to listen with the ears of our hearts. More recently, another Benedict, Pope Benedict XVI, has reminded us how to carry on this work that the saint from Nursia made central in furthering the mission of the Western Church. The Church continues to teach us how to open the ears of our own hearts. Here is how lectio divina works. The first step in the method of divine reading consists in selecting and reading a particular text. Although any passage of Scripture can be an encounter with God and a means to converse with Him, those from the Mass, especially the Gospel of the coming Sunday’s Mass, should be among our first choices. We will discover, especially as we become accustomed to the method of divine reading, that texts in which God’s Word is most explicit — that is, in the incarnate Christ — and where we can more easily see and hear Him in our mind’s eye and ear are the most helpful. With our scriptural selection in hand, we can begin reading. Unlike most of our reading, which is done quickly, this inspired Word — remember, it is ultimately Jesus in these words — is read slowly and carefully. What does the text say in itself? What does the Church — the teacher of the art of listening — want us to hear? As a good teacher, the Church knows that repetition is the mother of all learning. So, after reading the text the first time, read it again — and again. The proclamation of the Gospel at Mass gives us a few insights for fruitful reading. Before the Gospel proclamation, the priest prepares himself by prayer, saying: “Cleanse my heart and my lips, almighty God, that I may worthily proclaim your holy Gospel.” Similarly, we should begin our sacred reading with prayer. Although any genuine prayer will suffice, we might consider one based on the priest’s own: “Cleanse my heart and my ears, almighty God, that I may worthily read Your holy Gospel.” Next, during the Mass’s Gospel reading, the priest or deacon stands, a posture that both expresses and fosters attention and respect. We don’t have to stand during our sacred reading, but we ought to find a posture conducive to attentiveness and reflection — a posture, that is, free from distraction and disturbance. Finally, at the conclusion of the Gospel reading at Mass, the priest or deacon kisses the Book of the Gospels as a sign of love. To signify our heart’s love for Christ the Word, we might consider a similar gesture in our own treatment of the sacred page. The second step in our divine reading is reflection. If we have read the passage slowly and repeatedly, in a place free from distraction and accompanied by prayer, the movement from reading to reflection will come naturally (or, if you like, supernaturally). If our concern during the first phase of divine reading inspired us to ask, “What does the passage say in itself?”, then in reflection we might ask “What does the text say to me?” Unlike a blog, an e-mail, a magazine, or a book meant simply to convey basic information, Sacred Scripture facilitates a heart-to-heart communion with God. Its words are filled with the Word. Jesus is speaking loud and clear to the ears of our hearts. The imagination is the best hearing aid at this time. Picture yourself in the scriptural passage before you. Are you one of the apostles who accompany Jesus and observes His works? Perhaps you are a nameless bystander who witnesses the healing of the paralytic. Have you come to hear Jesus with the crowds only to find yourself being fed by the miraculously multiplied loaves and fishes? Maybe you are a particular figure before Him, such as the diminutive Zacchaeus at the base of the sycamore tree or the high priest Caiaphas overseeing the trial of Jesus. Or imagine you are Jesus Himself carrying the Cross — what would He have experienced? By placing ourselves in the Gospel passage with as much detail as possible, we can reflect more clearly — and hear more deeply — the Word of the Father, who comes to us. After we read and reflect on the Gospel passage, the third movement in divine reading calls us to respond. As we saw above, neither salvation history nor the Liturgy of the Word that reflects it are monologues, where only (mono) God does the talking (logue). God does indeed want us to listen, but He also wants our response: He desires a dialogue, a speaking back and forth across the divide that still separates us. If we have heard the Lord speaking to us in the scriptural text, what can we say to Him in return? If the Word tells us that we must be more generous (like the widow who gave her last penny), less ambitious (like James and John, who sought places next to Christ in glory), quick to forgive (as Jesus did from the Cross), or confidently trusting (like the blind men seeking sight from Jesus) — or any of a thousand things Jesus wishes to speak to us — how will we respond? Words responding in praise, thanksgiving, petition, or adoration, or even silent prayer are suitable. God reveals Himself, says Pope Benedict, as a “dialogue of love between the divine persons.” Our conversation with Christ at this point is His invitation and our acceptance to join in the divine dialogue. A fourth step contemplates the dialogue that has taken place between my heart and Jesus’ heart. Can you recall the great conversations in your life? I think back and hear clearly my future wife’s response the morning I asked her to marry me. On another occasion, I can hear our doctor offering a hard diagnosis regarding a difficult pregnancy. I also recall the bittersweet parting words of a bishop I served before he was reassigned to another diocese. Each memory recalls a remarkable conversation; yet none of these discussions in my life is quite so extraordinary as a prayerful dialogue with Christ. Contemplating this heart-to-heart talk — be it comforting, challenging, or encouraging — helps me see the world and my place in it in a new light, just as I gained a new perspective from becoming a joyful fiancé, a worried father, or a grateful friend. St. Paul’s Letter to the Romans calls us not to be conformed to this world — be it fifth-century Rome or twenty-first-century New York — but to “be transformed by the renewal of our mind” (12:2) so that we may see by the light of Christ — the same light that illuminates saints in the eternal city of the heavenly Jerusalem. This article is from a chapter in A Devotional Journey into the Mass. A fifth and final step of divine reading is the resolve to act. The dialogue with the divine not only renews the mind, as St. Paul says, but renews all aspects of life, making us “living sacrifices,” a key Catholic concept we’ll unfold in the next chapter. St. Irenaeus of Lyon (d. 202) remarked that the “glory of God is man fully alive,” and that this abundant life is born from “the vision of God.” To see God face-to-face — or, for our purposes, to hear and converse with Him heart to heart — gives life. Our interactions with our siblings, children, co-workers, spouses, and each man on the street are now infused with grace and elevated to a higher plane. Conversing with Jesus moves our hearts, and our hearts move our bodies, and our bodies become living cells that move the Mystical Body ever closer to its full stature. The circumstances of each life will determine how we affect others, and it is necessary for each of us to ask at the end of our divine reading: “What concrete conversion of life is the Word calling me to?” Like the blessed Benedict who heard the Word with the ear of his heart, our own hearing transforms and divinizes us and, through us, those we encounter in the details of daily life. We may not be called to plant monasteries throughout the Italian countryside, but by praying with the Word of God, we ought to be inspired to do something magnifi­cent for the sake of God. Reading: How do I engage the text at hand — preferably the coming Sunday’s Gospel — through a slow, prayerful, reading and rereading of the text? Reflection: What is Jesus, the Word, saying to me through the text? Response: How do I reply in sentiments of love, adora­tion, thanksgiving, or supplication to Jesus? Contemplation: What things do I consider after the divine conversation that has just taken place and the spiritual insights it gives? Resolution: What actions has this reading inspired me to carry out in the life opening before me in the week ahead? Although the method does require effort, the work it in­volves always yields spiritual fruit. The Mass’s proclamation of the Word is indeed powerful, but to benefit from such power, we the faithful ought to pray with the passage in the days lead­ing up to Mass and in the days following. When our ears and hearts have been attuned to the Sunday Gospel passage, its words have more emotional punch, greater spiritual force, and keener meaning for us. On Thursday, put step 3 into words: “What do I say to God in return?” I’ll ask my son Laurence, “What do you say to Jesus?” On Friday, the family may read and rest in the conversation unfolding before it, and on Saturday, individually or together, either privately or publicly, family members commit to changing specific elements in their lives for the better. When Sunday comes around, it will be impossible to hear the Gospel reading with deafness, inattention, or passivity. A true encounter with God will take place. St. Benedict encourages us to hear with the ear of our heart, and divine reading helps us to do it. 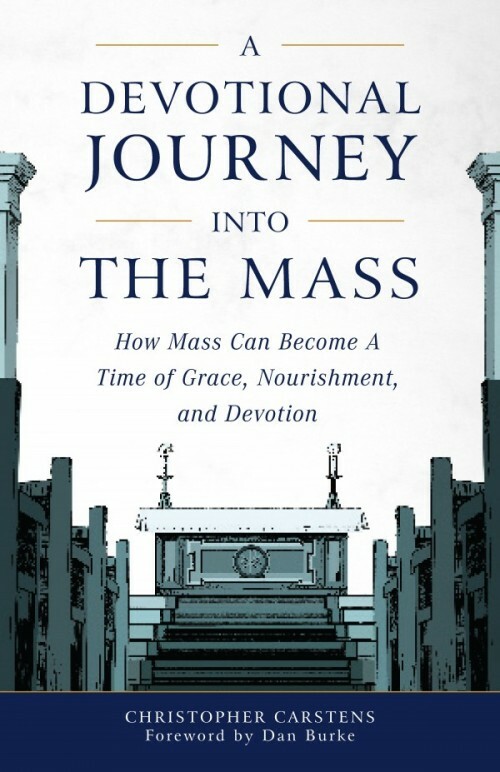 Editor’s Note: This article is adapted from a chapter in A Devotional Journey into the Mass, which is available from Sophia Institute Press. Christopher Carstens is Director of the Office for Sacred Worship in the Diocese of La Crosse, Wisconsin, instructor at Mundelein’s Liturgical Institute, editor of the Adoremus Bulletin, and a voice on The Liturgy Guys podcast.